Another morning rundown, to keep track of all this for future reference. Lots of little things going on, not sure which will become important when. Yesterday’s DoJ press conference was about the arrest of nine Russian spies. Probably should be bigger news, but it can’t compete. More important was the news that they’ve identified a Clinton/DNC lawyer who was involved with the FBI/Fusion in the FISA wiretapping case. As I said yesterday, we’ve known the basic shape about that for a while, but now they’re filling in the details. When Sessions brings people to court for it, there won’t be any I’s left un-dotted. 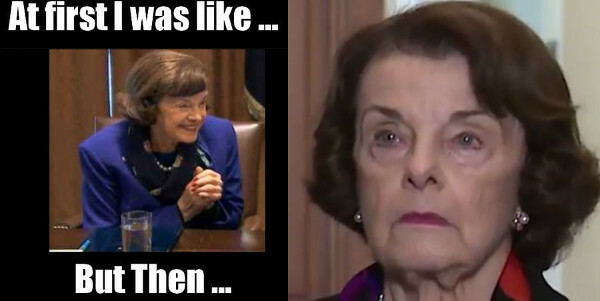 Feinstein looked like she ate a bug coming out of Schumer’s office yesterday. Or like she found out she could be charged with witness and evidence tampering. Ford’s buddy McLean keeps getting more interesting. She was presented as just a “beach friend,” but it turns out she left the FBI during the Trump transition, where she worked for a man involved in the aforementioned FISA crimes, and her lawyer’s name comes up many times in the Strzok/Page communications. Every time you turn over a rock in the Swamp, these same people keep turning up. Why do you need a highly connected, very expensive lawyer anyway, when you’re supposedly just a friend of the accuser who came along to offer some support and a character reference? And now one of Ford’s friends says McLean pressured her to change her story about not remembering the party Ford said she was at. They were so sure the Republicans would back down and let them turn this into another endless investigation like Mueller’s. Now it’s turned into an investigation of them, and they’re having trouble calling it off because their deranged followers are outside protesting and demanding more of it. The media is now reduced to gaslighting Republicans with silly claims like a Republican might not vote because he has a wedding to go to. Expecting more fun along those lines today.